> at Kungl. Konsthögskolan´s website. If we look beyond the state and private property driven developments, which have dominated the urban landscape throughout Europe during the last fifty years, we encounter a rich tradition of cities and communities formed on the principles of the commons. Having been out of the picture for quite a while, the commons is regaining momentum in the international debate on and around spatial and social justice, the use of natural resources, and digital cultures. Both through practice and exploration, the concept of commons enters the contemporary city. COMMONING THE CITY is an exploratory journey into the field of urban commons. We would like to invite you to join the ongoing investigation of what urban commons is at present, how it translates to Stockholm in particular, and what its potentials are for the future of the cities around the world. 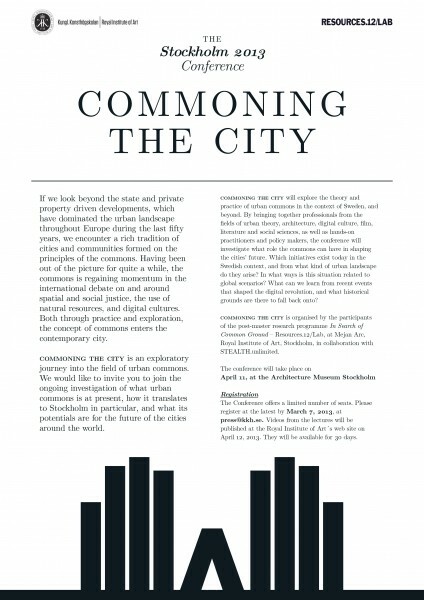 COMMONING THE CITY will explore the theory and practice of urban commons in the context of Sweden, and beyond. By bringing together professionals from the fields of urban theory, architecture, digital culture, film, literature and social sciences, as well as hands-on practitioners and policy makers, the conference will investigate what role the commons can have in shaping the cities’ future. Which initiatives exist today, and from what kind of urban landscape do they arise? In what ways is this situation related to global scenarios? What can we learn from recent events that shaped the digital revolution, and what historical grounds are there to fall back onto? COMMONING THE CITY is organised by the participants of the post-master research programme In Search of Common Ground – Resources.12/Lab, at Mejan Arc, Royal Institute of Art, Stockholm, in collaboration with STEALTH.unlimited. The Conference offers a limited number of seats. Please register at the latest by March 15, 2013, at press@kkh.se. Videos from the lectures will be published at the Royal Institute of Art’s web site on April 15, 2013. They will be available for 30 days.